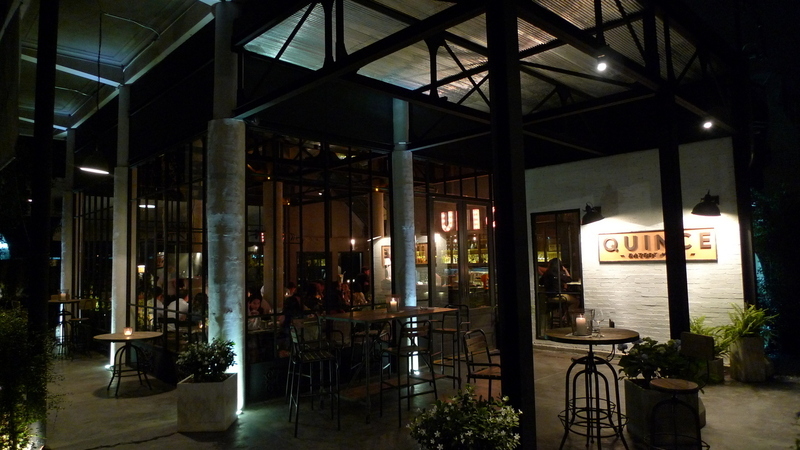 “Quince” is the name of a new restaurant that recently opened, after a lengthy soft opening, on Bangkok’s Sukhumvit Soi 45. Named after a fruit that is generally astringent and sour, but which yields delicious results with attentive preparation, the restaurant is meant to convey the idea that there is substance beyond the surface, a celebration of food and friendship that is about more than initial impressions. With that in mind, I dined at Quince three times over the last month and found a restaurant that, despite a few initial hiccups, seems to be ready to make a unique mark on the local dining scene. Located in a three-story renovated home tucked behind home decor shop Casa Pagoda (the owners of which are also involved in the restaurant), Quince features different dining areas with distinct atmospheres: the front room, which faces the bar, has high ceilings and a lively vibe. 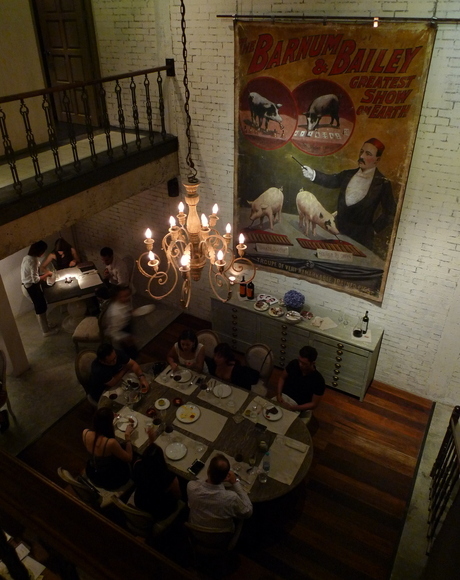 It fits in well with the “see and be seen” aspect of upper-end Bangkok dining culture. The back room is a more intimate space with a softer ambience and a lower volume. When I dined there, I found it very easy for a table of four to carry on a conversation at a civilized volume. The restaurant also has a trio of private dining rooms that allow various sized groups to enjoy privacy and quiet while they have their meal. The chef consultant is Jess Barnes, pictured below slicing blood sausage at a recent Big Bite Bangkok event. I first met Jess in March at the Lard-o-Licious pop-up restaurant at Opposite. Jess, who hails from the Barossa Valley in South Australia, has a professional background strongly rooted in Italian food and butchery. His cooking, though, runs the gamut from classical to modern, and his emphasis is on whole-animal cooking and local/seasonal ingredients. As such, the menu changes frequently, which makes multiple visits interesting but also seems to be a little challenging for the staff. The menu is divided into small dishes, salads and veggies, and more substantial plates. Prices for the first two groupings seem a bit lower than I would expects while the more substantial plates have more substantial, although still reasonable, prices. There is also an extensive, well built wine list that feature good values – something you can’t often say in Thailand. Let me share some pictures from the variety of dishes I tried in my three visits, along with some notes about them. 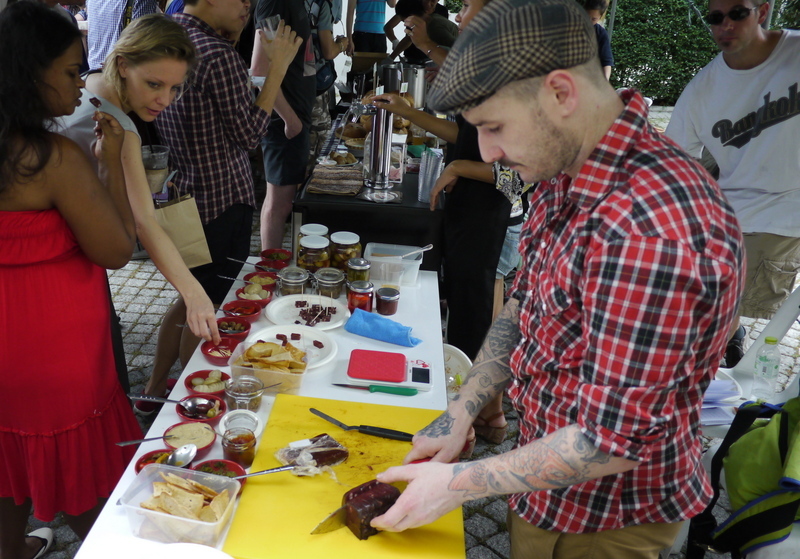 All in all, I really enjoyed the food and found it tasty, well-prepared, and often creative. There were a few dishes that didn’t seem to fully come together, but that is common when a restaurant is in its soft opening phase. I would expect that in the coming months, the menu will grow stronger as winning dishes earn a regular place and weaker dishes undergo some tweaking. Most restaurants in Thailand serve food family style and Quince follows this custom with lots of smaller plates that are perfect for sharing. On the left are roast potatoes with garlic and rosemary. 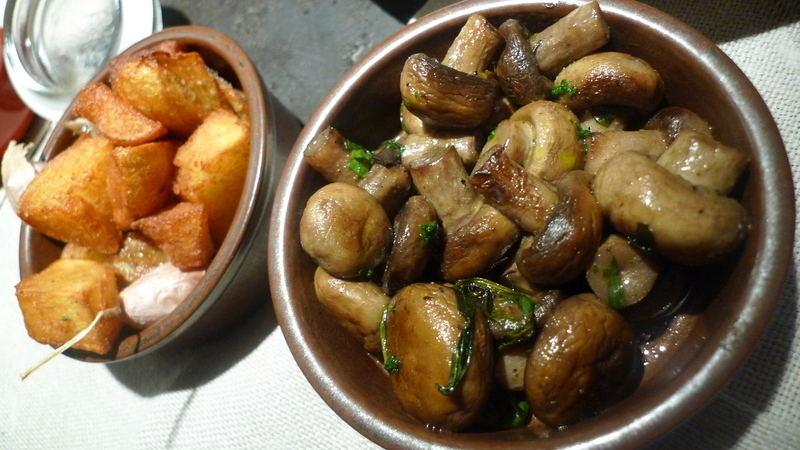 On the right, sautéed mushrooms with tarragon, garlic, and sherry vinegar. Both these dishes were well-executed although both would benefit from a more assertive use of herbs. Jess’ background is butchery and his skills particularly shine in dishes like this pig cheek rillette, served with quince jam and pickles. 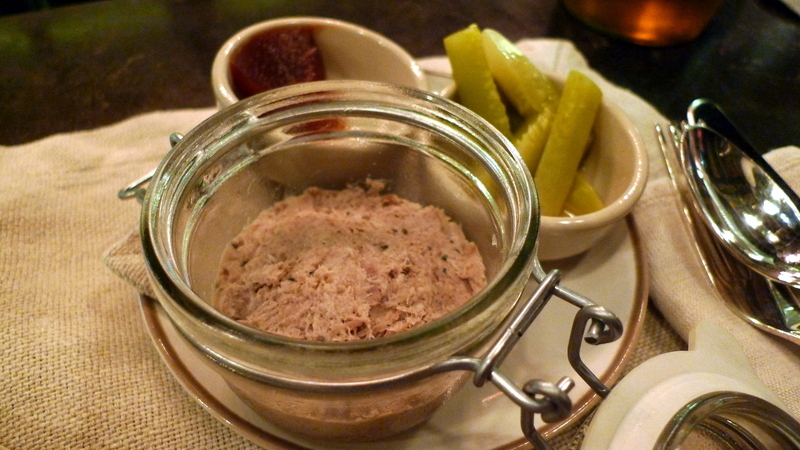 A rillette is a poor-man’s pâté, with meat (usually pork) chopped, salted, and cooked in fat until it achieves a spreadable consistency. This particular rillette tasted slightly underseasoned when eaten on its own, but when paired with the homemade quince jam, it came to life. This is a dish I would buy to keep in my refrigerator for late-night snacking. 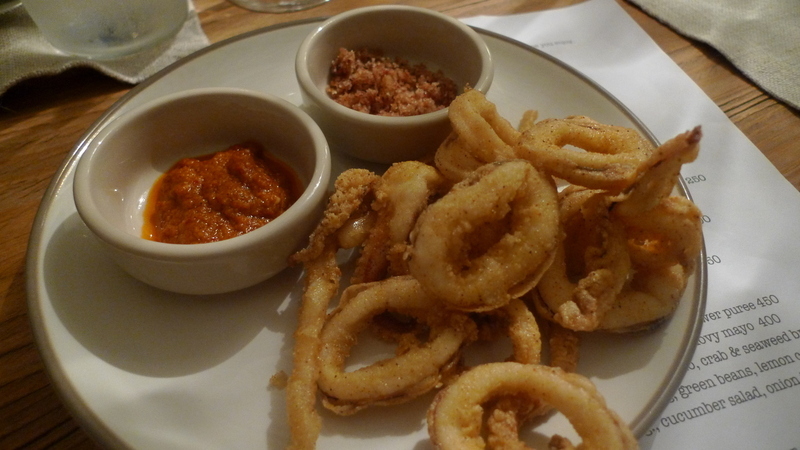 The fried squid with romesco sauce and ham powder was a tasty menu item. The squid itself is faultless although doesn’t stand apart from similar dishes at other restaurants. It is the romesco sauce, a Spanish nut and red pepper sauce that appears several times on the menu, that is the star of the dish. Jess’ romesco sauce is fiery and rich, with a combination of flavors that compel you to eat more and more of it. 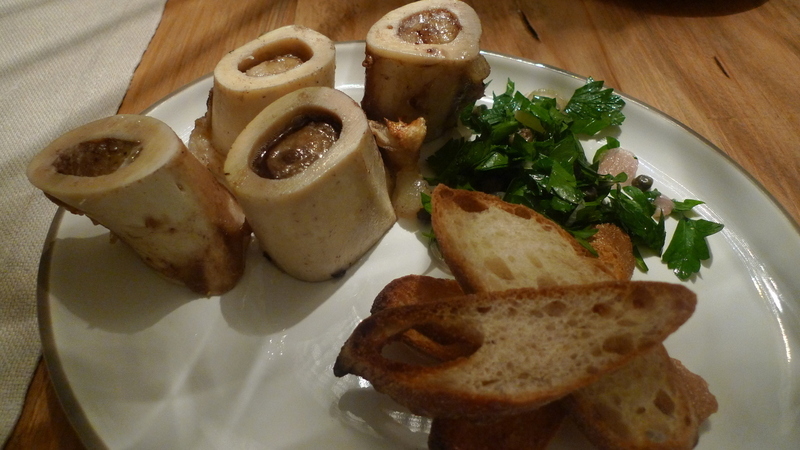 The roast bone marrow with parsley and capers, served with toast, is a dish I first tried at the Lard-o-Licious event. I really enjoy bone marrow and appreciate it being on the menu. In this preparation, the Italian parsley, with its characteristic bitter earthiness, seems overpowering. Perhaps if it were minced more finely with the capers, it would be an easier condiment for the marrow. The menu contains a lot of items that are vegetarian (10 out of 26 dishes on one of my three visits), perhaps a testament to a period of his life when Jess was into veganism and first discovered cooking. 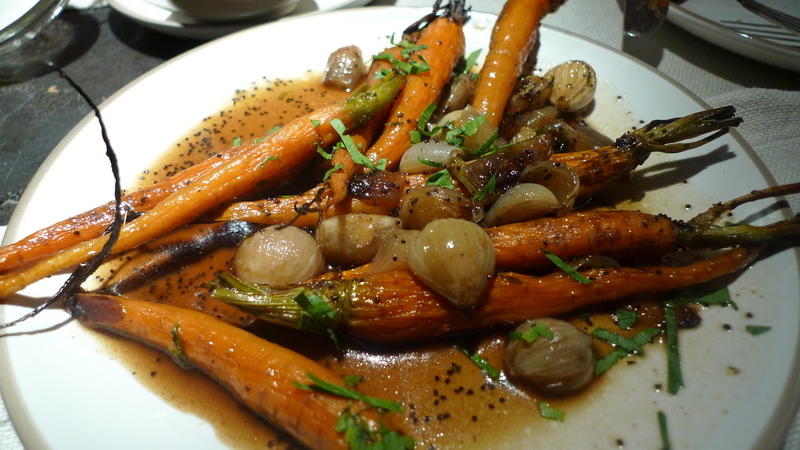 This dish of roast carrots, poppy seeds, shallots, and honey is not only gorgeous to look at, it is a delight to eat and it says a lot that a chef with a butchery background is able to create so much flavor without the use of meat. 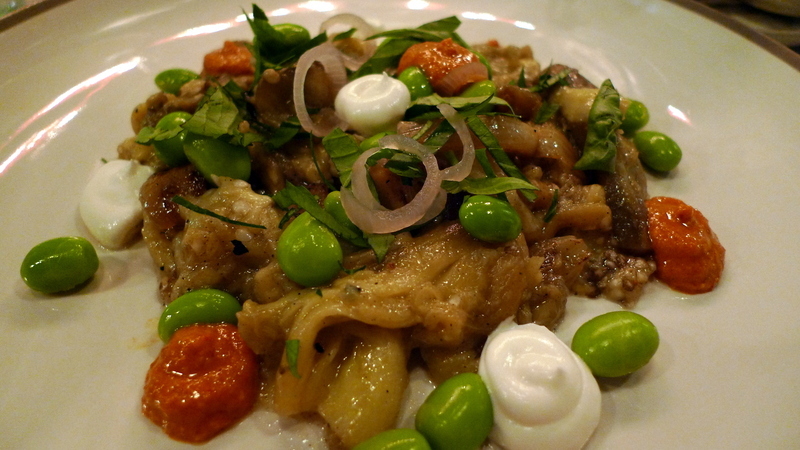 Another example of this skill, and a dish that is one of my favorites on the menu, is a plate of smokey eggplant, labne, sweet onions, romesco, and edamame. There is surprising depth of flavor in this dish, which will trick you if you don’t get a bit of all the ingredients in your first bite. The eggplant itself has a rich smokiness, almost a meaty quality, but is under-salted on its own. But when you include the labne, onions, and romesco, whole dimensions of flavor are unlocked. This is a standout dish. 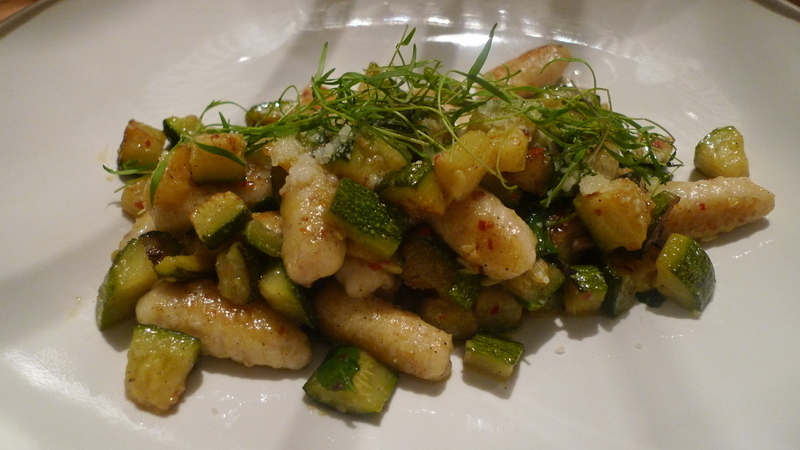 On two visits, I tried the ricotta gnocchi with parmigiano, vegetables, mint, and chilli. The first time, the vegetable was zucchini, which went really well with the mint. The second time the dish had broccoli instead of zucchini, which was less successful. In both cases, though, the chilli was not noticeable and the dish would have benefitted from it being spicier. The gnocchi, though, were tender and perfectly cooked. 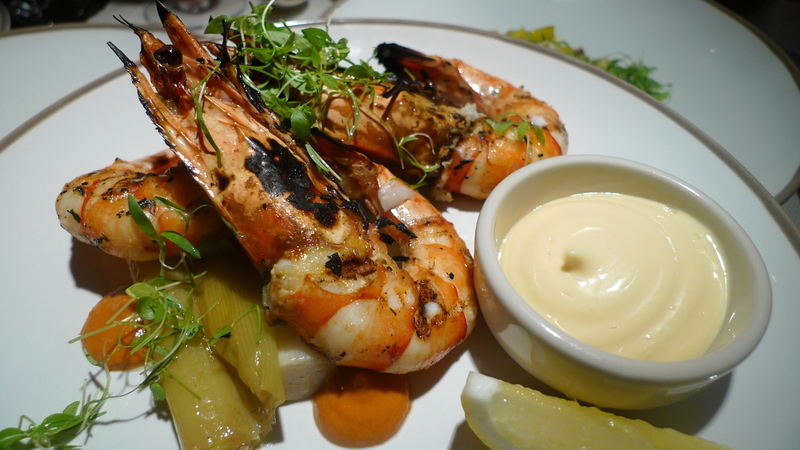 Visiting the “more substantial” portion of the menu, I tried the grilled wild tiger prawns with prawn mayo and leeks. The prawns were fresh, cooked very well, and had a nice char on them. The fish of the day was different each time I was there. 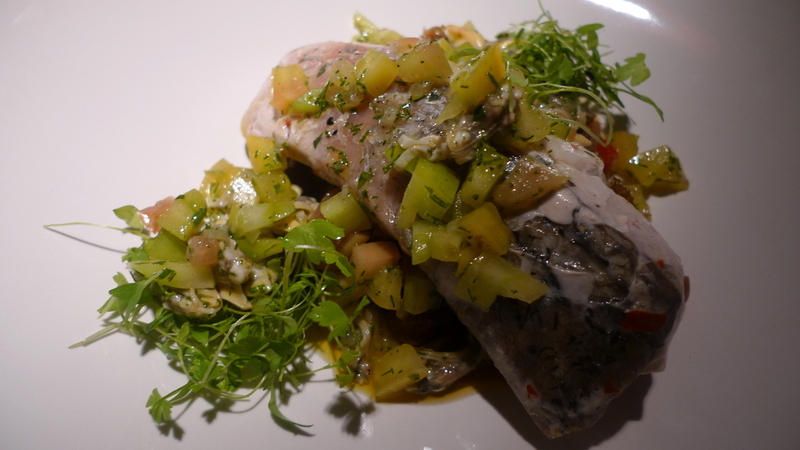 Or, rather, the preparations were different as on two visits the fish was sea bass. 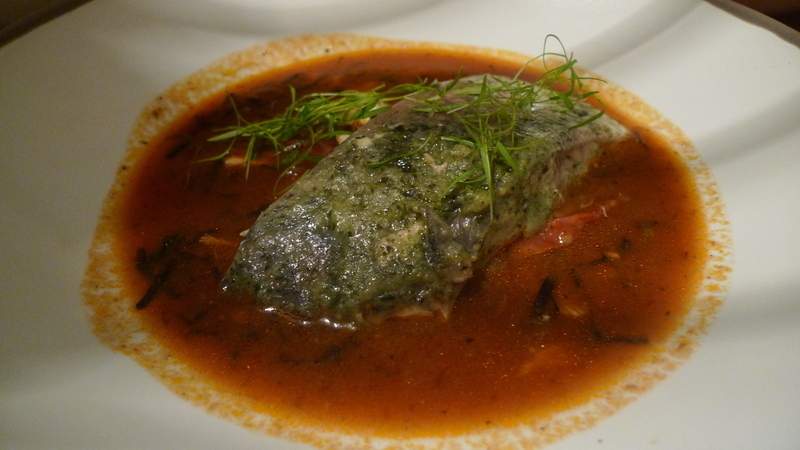 On my second visit to the restaurant, I tried the poached sea bass with a chorizo, crab, and seaweed broth. The fish was cooked well but the broth didn’t work for me. Despite the color, I didn’t detect any flavor of chorizo sausage, an ingredient that would have paired nicely with the meatiness of the fish. To top it off, the seaweed overpowered the broth, giving it a fishy flavor that was unpleasant. Of the six diners in our group, only one enjoyed this preparation. On my third visit to Quince, I tried the poached sea bass again, this time with a caponata, a Sicilian cooked eggplant salad that also had green tomatoes and clam. The vegetables were nice, but I found the fish undercooked and there were several scales on the piece that was served. 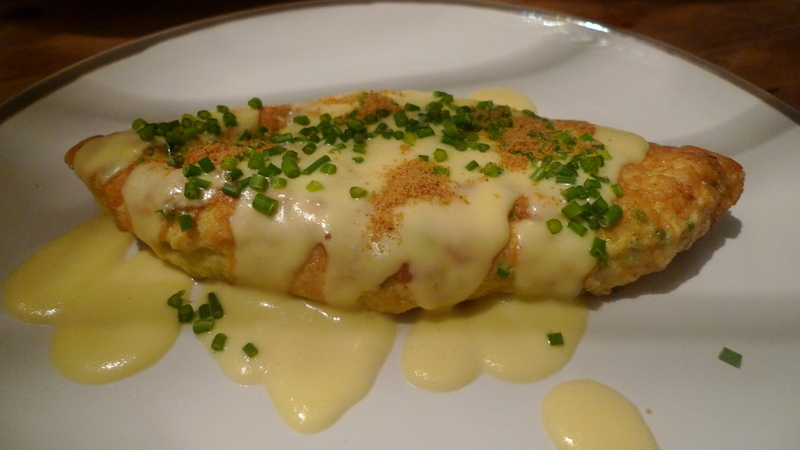 The fourth seafood dish I tried, a crab omelette with chives, sweetcorn, and lime, was a tastier option than the sea bass. The preparation and flavors were good. The dish seemed a bit out of place on the menu, though. Crab omelette is a Thai staple and while it wasn’t prepared specifically in a Thai style, it seemed to be the only dish on the menu referencing Thailand. While the dish was tasty, it seemed not to fit the rest of the menu and I don’t know if I would order it again unless I was eating it as a one-dish meal, in which case it would be just about right. The “more substantial” plates from land-based proteins were more successful than the sea-based ones. One of Quince’s signature dishes (which was sold out on my second visit so I had to try it on my third), was wet roasted chicken served with saffron and almond broth, barley and harissa. This dish is very tasty and the chicken has a lot of flavor. It would be perfect on a cold, rainy night or – since we have no cold nights in Bangkok – just a rainy one. 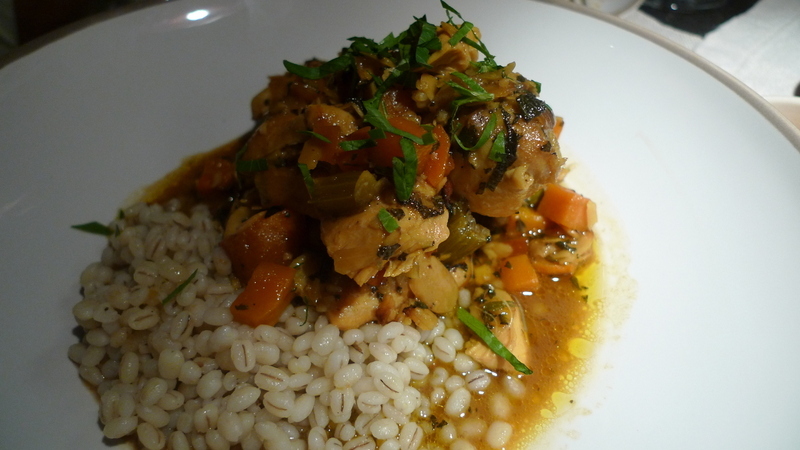 The barley was a nice choice and a good match to the chicken. My only criticism: the harissa listed on the menu, a Tunisian chili sauce, seemed largely absent in flavor. For being in Bangkok and having a primarily Thai clientele, the food at Quince seems very shy when it comes to spice. 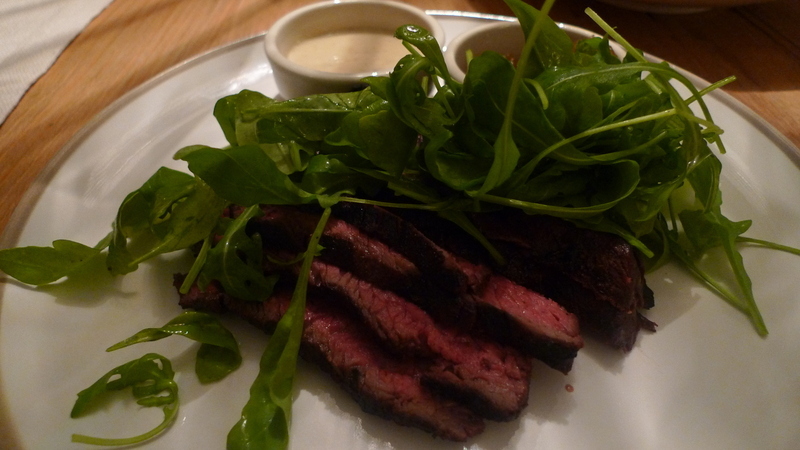 The hanger steak, sliced medium rare, and served with rocket with anchovy mayo, was a well-preapred classic. The steak was flavorful and nicely cooked. The peppery rocket was a good choice to accompany the dish and the anchovy mayo was nice, too. 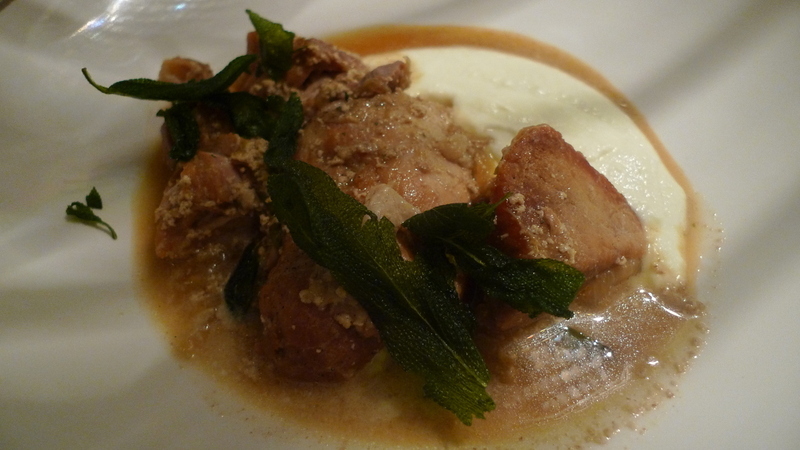 One standout main course was the pork shoulder braised in milk and herbs, served with cauliflower purée. This is another dish (minus the cauliflower) that I first encountered at Lard-o-Licious, one of what I am coming to consider as “Jess Barnes staples.” In this case, the preparation at Quince was better than at Lard-o-Licious and it was a favorite of the diners who joined me on this visit to the restaurant. 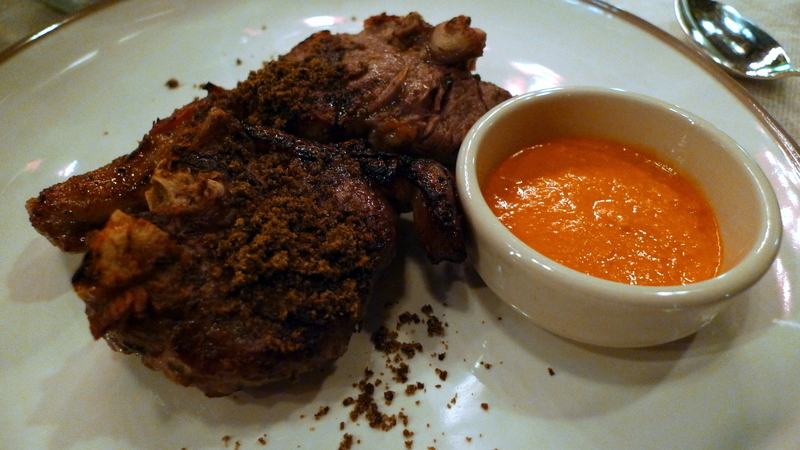 The final meat dish, one I tried on my first visit to the restaurant, was a grilled lamb loin chop served simply with romesco sauce. The chops were well-seasoned but seemed inconsistent in size and shape, not looking like they were the same cut of meat. Nonetheless, the lamb paired well with the romesco sauce. I haven’t seen this particular dish on the menu in subsequent visits, although there seems to usually be some cut of lamb available. The dessert selection on the Quince menu is limited and seems to usually have three items plus a trio of gelati. 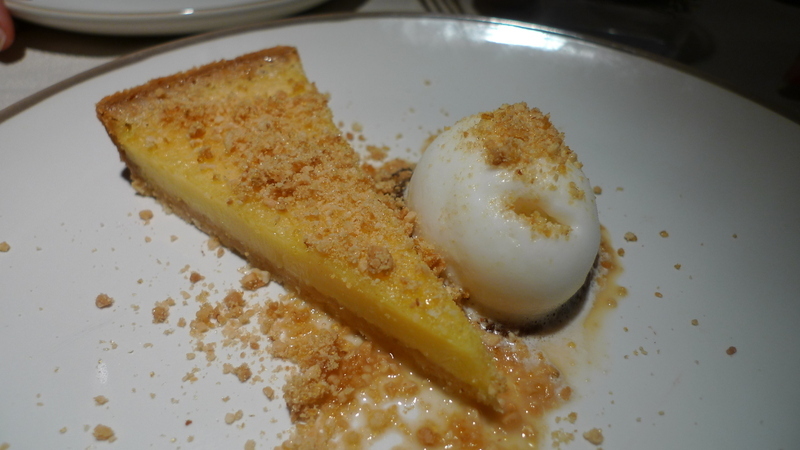 On my third visit, I tried the lemon tart served with salted caramel, peanut brittle, and dulce de leche sorbet. I found it very refreshing and the peanut brittle was particularly interesting. 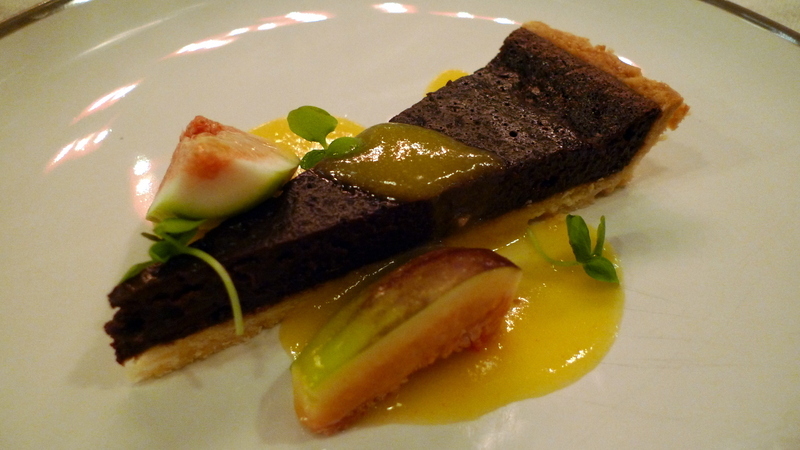 This chocolate tart may be the signature dessert as I have seen it on the menu all three times I’ve visited Quince, although each time it is dressed up differently. This was my favorite of the three ways, served with fresh fig and a bitter orange sauce that complimented the chocolate. On the other visits, the tart was served with salted caramel, peanuts, and vanilla ice cream (okay) and then rose sorbet, fig, and orange (somewhat more interesting). 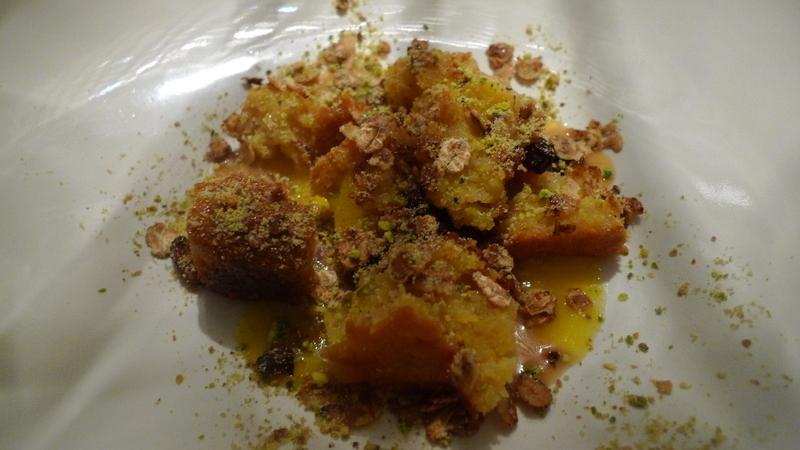 On my second visit, I tried this orange and almond torte served with milk jam, muesli, and pistachio. This dessert provoked mixed reactions: one fellow diner had some sharp words to say about its appearance, finding it messy to the point of revulsion. I returned to the dish for several bites and while I agreed that it looked a mess, the torte was very moist and I like the orange and almond flavors. Maybe a rework of presentation would make it a winner. Based on three visits, I am pleased with Quince. The atmosphere is pleasant, especially the fact that the different dining spaces provide different types of ambience, so where you sit can be matched to your preference. The service, which has admittedly been hit-and-miss, will likely improve as the staff becomes more familiar and routines are developed. The food is creative and well-executed and, most importantly, there is a clear sense that Jess and his kitchen team are exploring. Food lovers will appreciate the thoughtfully-prepared menus, particularly as the dishes continue to be refined and improved over time. This entry was posted in Uncategorized and tagged Bangkok, Barnes, Dining, food, Jess, quince, Restaurant, Review, Sukhumvit by christao408. Bookmark the permalink. Interesting – sounds like with the right choices you end with a delicious meal. But one would have to go several times as you did. It all looks so delicious but I’m afraid I must admit that I most likely lack the palate to truly appreciate that grade of dining. I’m finally entering the phase of ‘this restaurant definitely tastes better than that one, and I can vaguely explain why”, and even then, only for a very few certain foods. Oh that looks like such a warm, comfortable place to dine and visit with friends. The food looks wonderful also. So good to see the pictures Chris. I am emailing this to myself, because I want to try and create the vegetable dishes, (eggplant, carrots and zucchini) and then make them for the fund raiser in November.Thanks. Your reviews are always thoughtful, balanced and well written. I was surprised the seafood dishes weren’t that good. I guess every restaurant has their blind spots. Looks good! Will definitely give it a try next April! @ZSA_MD – That smoked eggplant dish would be a winner. You could grill it first to get the flavor. @ElusiveWords – Thanks for your kind words Matt. It is possible that I managed to get two bum fish dishes and that they aren’t representative. @Fongster8 – We will see what else opens between now and then, worthy of your attention. @murisopsis – I’m curious what the relationship is between dietary cholestrol and blood cholesterol. I’ve read some things recently questioning whether there is a cause-and-effect relationship. @armnatmom – Ha ha – you are welcome to subscribe anytime. =D@Grannys_Place – The space is very appealing and that, of course, is an important part of the experience. @secade – It is a learning experience, like everything else. When I lived in the US, I thought that all Thai food tasted good. “No such thing as bad Thai food,” I thought. Of course, as I’ve learned more about Thai food and liver here now, I have a greater appreciation and understanding of it, and can better distinguish differences in quality. 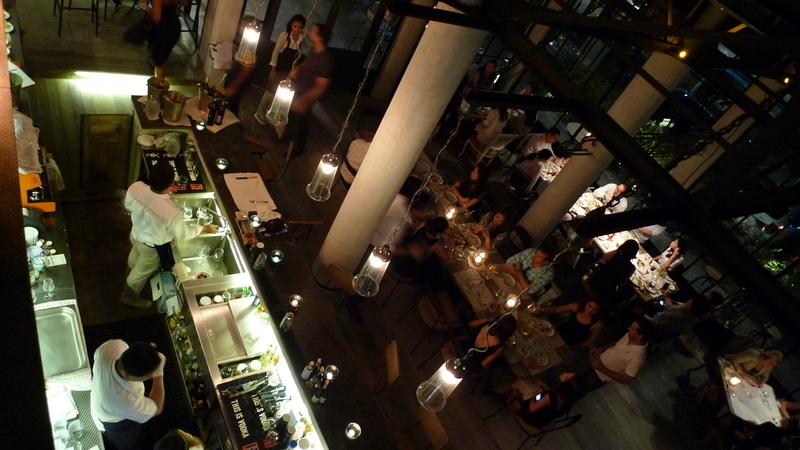 @CurryPuffy – No doubt, the Bangkok dining scene has matured a lot even in the last five years. More and more for you to try on your next visit. @Fatcat723 – I suppose if you go just once but with a large group, you improve your odds of getting a good meal. @rudyhou – Perhaps you need to extend your stay?